I could easily imagine the psych-pop band Turquoise performing this track! Lyrically it owes a bit to "Mother's Little Helper", though certainly more sympathetic to it's overloaded domestic protagonist. 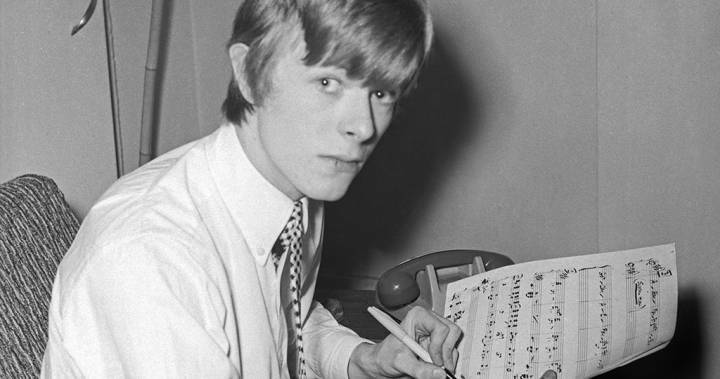 It's an unusual number for a David Bowie track because it features some harmonica, but it has potential to be incredibly heavy which is not something you would expect for David Bowie at this period, and the multiple layers of guitars almost going into the red recalls Keith Richard's cassette recording guitar sound on "Street Fighting Man". 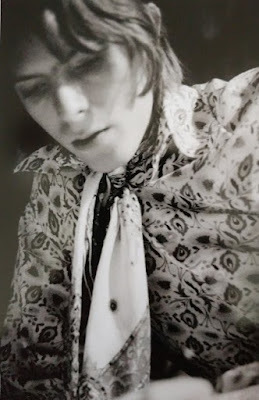 Interestingly this demo was recorded between a December 1967 Top Gear session version orchestrated by Arthur Greenslade and the more well known spring 1968 studio version produced by Tony Visconti (which would not see the light of day until Decca's 1970 compilation LP "The World Of David Bowie") so it is obviously NOT the original demo version. It doesn't really offer much except that Bowie sounds like he is straining at the top of his key to get through it in parts and the lyrics are the ones used a few months later in the better known Visconti produced version. Not to be confused with “Threepenny Pierrot” (see below) this track is quite unremarkable and no doubt explains why none of us have ever heard it before. Another unremarkable track sounding somewhat like a watered-down Cat Stevens Island Records era tune. Pairing different lyrics from the various "finished" versions available this number takes its name from a conversation David Bowie claims he heard from a departing West Indian family at a Victoria Station or maybe he was confusing it with hearing Paul McCartney discuss the similar origin of "Ob La De Ob La Da". This demo version is rather interesting as it's completely sparse and there's two verses not found in subsequent later versions. The melody was also utilized in a number “Threepenny Pierrot” a track he wrote for a Lindsay Kemp production "Pierrot In Turquoise" around the same time. Here's another one that to my ears is pretty unremarkable. It bears a slight resemblance to something you might have found among the weaker tracks on his second long player. Same track as above delivered at a more somber softer pace with slightly different lyrics next…. This is quite possibly the very first demo version of the now famous hit single! The lyrics are quite different in places showing the Major Tom of this version to be quite a reluctant participant in his space voyage (“can I please get back inside now if I may?”) and perhaps presaging the Major Tom of “Ashes To Ashes” and his nihilistic view on life on Earth (“though I'm past 100,000 miles I'm feeling very still and I think my spaceship knows what I must do and I think my life on Earth is nearly through”) leading to a far darker characterization of what amounts to suicide by space travel, lyrics that no doubt would have been too "dark" for commercial success. This version has lead vocals by David Bowie's companion John Hutch Hutchinson at the introduction with Bowie coming in after the countdown section. 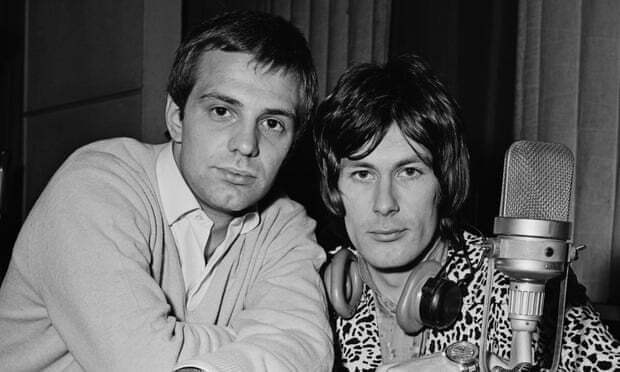 It also contains some Stylophone which adds an eerie effect to accompany the acoustic guitars, also noticeable in the background occasionally are the sounds of Hutch's toddler, Christian (Hutch can be heard at the beginning of the track asking "Chrissie, don't talk"). By far this is the most amazing track on the box and contains an interesting melody not found in the final original take but utilized in the primitive version heard in the promotional film “Love You Till Tuesday”. The ending is interesting as the key keeps changing higher and higher and there's a Morse code being tapped out on the Stylophone at the fade out. Bobby Shafto cut a number of innocuous pop singles in the UK and "She's My Girl" was his first (and in my estimation best) of his 5 US releases on the obscure Rust label. Led by a blistering guitar lick it reminds me of The Roulettes on one of their more upbeat sides. 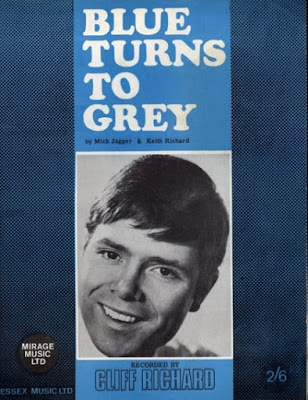 Adam Faith released 12 singles in the US, three of them carrying The Roulettes in the credits. "I Don't Need That Kind Of Loving" was his final US 45 to carry a co-credit on the label and is my fave of them. The backing by The Roulettes is raw and well executed and it's one of Faith's strongest vocal outings in my book. 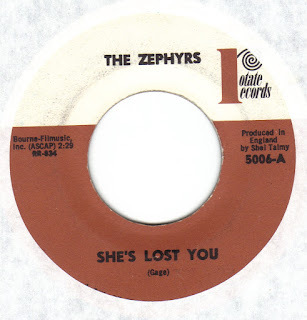 The Zephyrs cut a bunch of singles in the UK but the last three on Columbia are where it's at in my book. "She's Lost You" is a powerful number with call and response backing vocals, combo organ (not unlike the early Animals) and a dance-able groove ! Produced by Shel Talmy. It was their first of two US 45's on the obscure Rotate label. Originally cut in 1962 in the UK by Danny Rivers and The River Men (and produced by Joe Meek) ex-Tornado and Joe Meek's golden boy Heinz had a crack at it as his 11th and final 45 (UK Columbia DB 7942). The backing is positively raw with some chicken squawk guitar licks care of Meek's stalwart session guitarist Ritchie Blackmore. 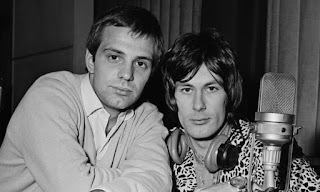 Previously known as The Brooks Brothers, brothers Geoff and Ricky had been cutting 45's as a duo since the late 50's. For their final single they became The Brooks and cut this up beat stomper on the flip of "Once In A While". With their tandem harmonies and rocking backing it comes off as a "with it Jan & Dean". This crazy Ritchie Blackmore instrumental (which he penned with rock n roll cretin and predator Kim Fowley) was only released in the US on the tiny Titan label (a sister label of Demon records) and last went on Discogs for $511!! Expensive cost aside it's a frantic little rocker with thundering drums and insane guitar playing (slightly reminiscent of "Guitar Boogie Shuffle" to my ears). The other musicians involved were Blackmore's chums from The Outlaws. Best known as the very first vinyl appearance of a young guitarist named Jeff Beck, "I'm Not Running Away" is a chirpy little slice of beat balladry with the aforementioned wiggy guitar runs from Beck and funky high pitched backing vocals with the obligatory double tracked lead vocals. 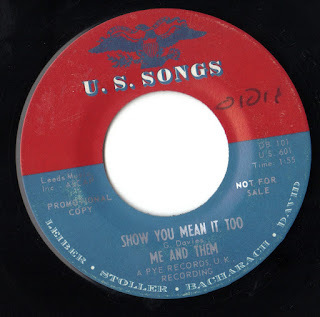 Me And Them cut 3 singles in the UK on the Pye label, this was their second one issued in April of 1964 (it was issued here 5 months later). It's a raucous little rocker with some sax, call and response backing vocals and bursts of twangy guitar. 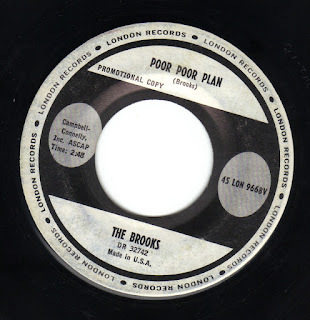 Not to be confused with a later, re-recorded and much fuller UK version on Decca this version was cut by Joe Meek and slipped out in the US on Tower (along with another Meek production that you can read about here). Buried in echoed guitar and the typical Joe Meek rhythm section mud Tom's vocals sound like he's at the bottom of a well singing for his life! The late British arranger/producer John Schroeder had a vast CV. 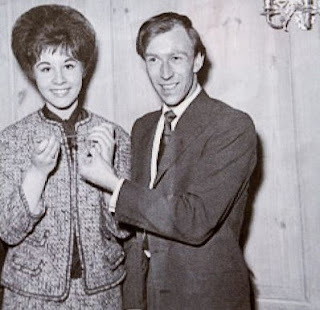 Coming to fame as the A&R man for the British label Oriole, he was best known for licensing releases from the US Motown label for British consumption on the label before EMI acquired the British distribution rights. Afterwards he moved to Pye where he became a producer and the man behind the commercially successful easy listening venture known as Sounds Orchestral (best known for their international smash reading of Vince Guaraldi's "Cast Your Fate Into The Wind" which rose to # 10 on the pop charts and #1 on the "Adult contemporary" charts). Schroeder then moved on to supervise Pye's off shoot label Piccadilly whilst continuing to be behind records by Sounds Orchestral as well as producing The Sorrows, David Garrick, The Bystanders, The Ferris Wheel and Geno Washington, to name a few. He also cut several of his own under the moniker of The John Schroeder Orchestra. The latter were, more times than often, kitschy instrumental versions of current contemporary pop/soul hits and occasionally theme tunes to TV shows and movies. His third UK single, a reading of Edwin Starr's smash "Agent 00 Soul" was issued in September 1965 as Piccadilly 7N35271. It was issued two months later in the US and was also his American debut. "Agent 00 Soul" is characteristic of what would later become Schroeder's instrumental trademark with flutes playing the main riff backed by heavy bass/drums and brass with the only vocals being smooth female voices singing "Double 00 soul" at the breaks and some tasty Hammond in the mix. It is alleged that the track enjoyed a revival on the Northern Soul scene but seeing as that has been said about a host of 60's instrumental tracks I will treat that with a pinch of salt. "Nightrider" is an instrumental with every thing but the kitchen sink thrown in: organ, bongos, flute, fuzz guitar, jazzy brass, the lot. It's uptempo but too chaotic to be dance able but still very groovy thanks to the organ and the razor sharp production and arrangement. Schroeder would later go on to cut the in demand and highly collectible LP "Working In The Soul Mine" the following year which was entirely composed of similar readings of soul/r&b tunes as well as the equally amazing "Dolly Catcher" album in 1967 that utilized a similar formula but with pop covers (and some very cool originals as well). He produced a host of pop-psych and soul/r&b bands as well as a deacdes worth of releases by Status Quo including their smash "Pictures Of Matchstick Men". 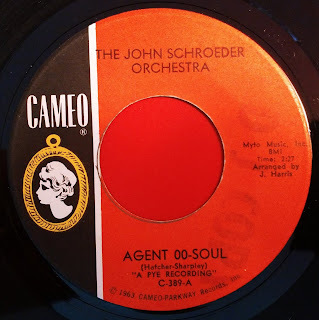 "Agent 00 Soul" was included on the 2005 Castle Communications double CD retrospective "Soul Coaxing: The Many Moods Of John Schroeder" while "Nightrider" popped up on the old and essential "On The Brink: Return Of The Instro Hipsters" instrumental CD compilation. Imagine this, you've been fronting an underground four piece psychedelic band for a few years and you've made records with them and in their previous mod/r&b incarnations to no avail and then your producer convinces you to sing on an orchestrated pop tune that becomes a fluke hit rising to #3. 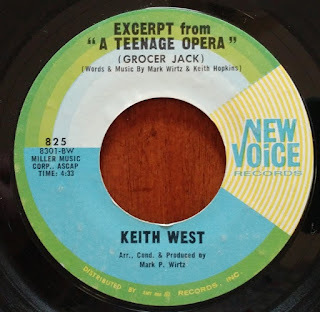 Such was the dilemma of the front man for the British psych act Tomorrow (formerly The In Crowd), Keith West when producer/arranger Mark Wirtz (described by West in an interview as "the German Tony Hatch") convinced him to sing on a studio project he was working on called "A Teenage Opera". The track's unexpected success ultimately drove a schism through Tomorrow who's underground cred no doubt suffered from being associated with such a poppy tune. 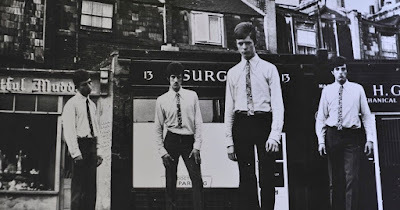 That said "Excerpt From A Teenage Opera (Grocer Jack)" was first issued in the UK as Parlophone R 5623 in July 1967 (minus the "Grocer Jack" bit in it's title). 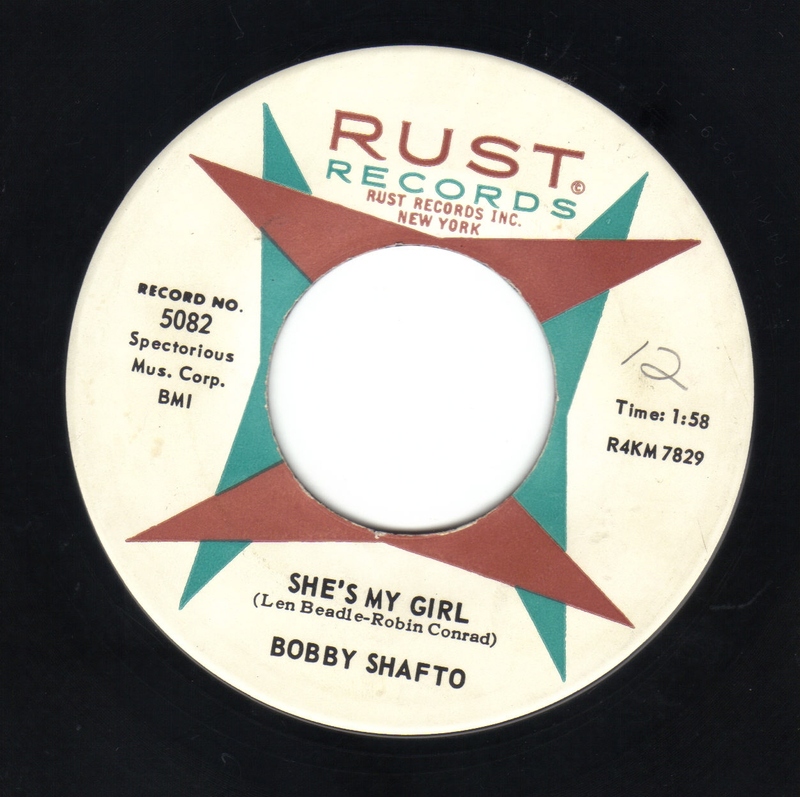 It was not issued in the US until October, where unlike the UK and Europe, it failed to chart (the 45 was issued in 12 countries outside the UK!). For those not familiar with the track it concerns the plight of an elderly shop owner named Grocer Jack ("count the days into years, this 82 brings many fears...") who fails to turn up one morning to open up for business. The town's mother's send their children to his house to harangue him not realizing that poor Jack has keeled over and died! The entire town turns out to mourn him, wracked with guilt for working him so hard. The number perfectly encapsulates the 60's genre of "toy town psych" to a "T" and no doubt influenced the Hollies "Charlie And Fred" and Kaleidoscope's "Mr Small The Watch Repair Man". It was orchestrated by Mark Wirtz with strings, horns and mandolin with a chorus singing backing vocals behind Keith West's lead vocals and a group of small children (from the Corona Action School) are utilized in the chorus ("Grocer Jack, Grocer is it true what mommy said you won't come back..."). The flip side, "Theme From A Teenage Opera" by The Mark Wirtz Orchestral is a muzaky piece led by some twangy guitar (care of Tomorrow's lead guitarist and future Yes man Steve Howe) against a wall of strings, horns and mandolin. Nothing earth shattering that you'd want to play more than once, but not horrible enough to lift the tone arm to terminate it. Wirtz used West on a follow up single "Sam" (Parlophone R 5651 November 1967) but it's lack of major chart success caused the Teenage Opera to be effectively sunk. Both tracks have been issued in a host of places, most notably on the RPM CD collection "The Fantastic Story Of Mark Wirtz And The Teenage Opera". Interestingly enough West and Wirtz collaborated last year in the production of "A Teenage Opera " play that was staged last year in England. We here at Anorak Thing H.Q. were gutted to read of the passing of Scott Walker. Though I've all but ignored his musical career (bar a track or two from "Nite Flights") after 1970's "Til The Band Comes In" long player his material was never far from my ears. 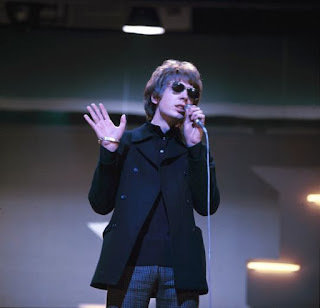 Scott Walker was one of those artists I had to get into after being force fed him for quite a few years and constantly reminded of his genius, while chaffing from the peer/media pressure I usually recoiled. It was not until 1997 that a friend of a friend was in town from Minnesota visiting his brother who was renting a spacious, decaying mansion like house in the semi affluent Jersey shore community of Elberon. Asked to look him up while in town I journeyed down to meet him and his girlfriend. While he and his girlfriend repaired elsewhere in the house to change to go out to eat he put Scott Walker on the stereo as I sat in the dank, mildew smelling living room with most of the furniture covered in sheets. The French doors to the patio were flung wide open and suddenly as "Montague Terrace (In Blue)" played the sky turned gray and a storm rolled in from the sea and I had my Scott epiphany and was instantly blown away. A month or so later in was knee deep in Scott Walker-mania and a girl I was dating, tired of hearing him, ejected and flung my Scott Walker cassette compilation that I had created out the window of my moving car somewhere on a highway. Scott Walker is one of those artists that you either get or you don't get. There's no in between. And since I am firmly in the camp of those who get it I'd like to direct your attention to an older post of my favorite tracks by the man that are up for your perusal here. Mick Jagger and Keith Richards were never going to be Lennon and McCartney when it came to flogging their compositions. 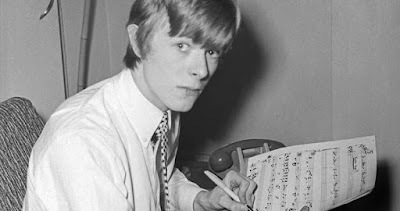 But with a nudge from manager Andrew Loog Oldham they eventually began composing and then offering them to other artists. 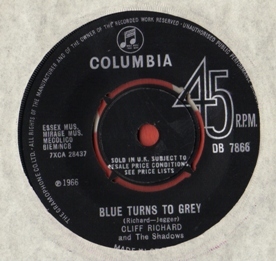 "Blue Turns To Grey" was one of their earliest pieces, first released by The Mighty Avengers in February 1965 as Decca F 12085. It was revived again in March 1966 by Cliff Richard & The Shadows, who unlike The Mighty Avengers managed a modest hit with it rising to #15 with it in the U.K. charts. 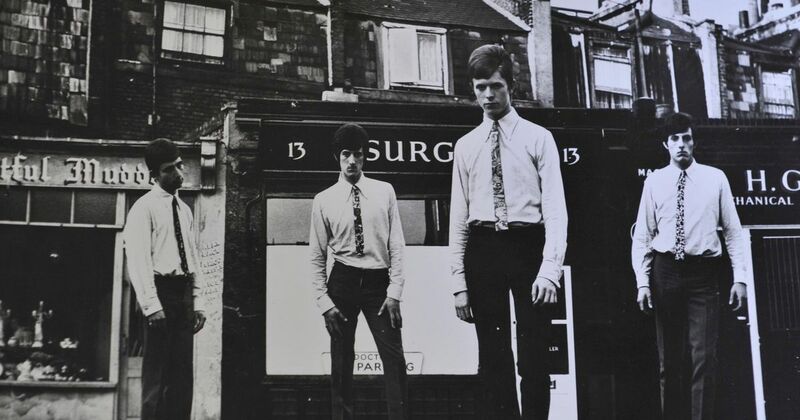 The Stones own version would not appear in the U.K. but was on their fifth U.S. album "December's Children (And Everybody's)" in December 1965. Cliff & The Shadow's reading is in my estimation, one of the best. Punctuated by some powerful vibrato guitar licks care of Hank Marvin it's faster and tougher than The Mighty Avengers (or The Stones lackluster version for that matter). Cliff's voice is spot on and The Shadows backing is flawless as always. The flip side "Somebody Loses" is mid tempo throwaway with a countrified feel that does zero for me. 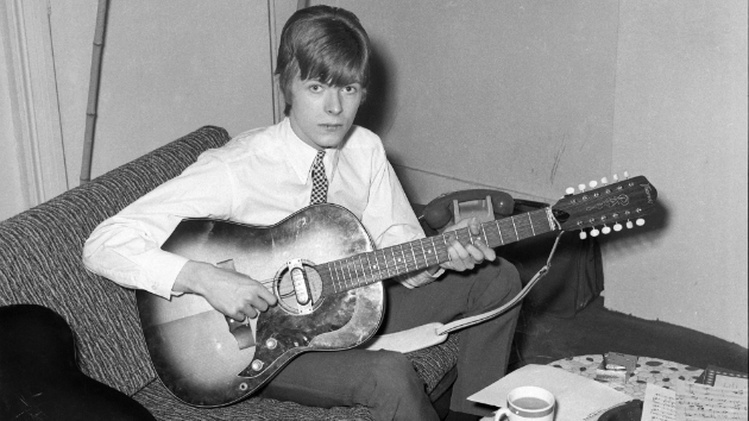 This muddy demo is an interesting bridge between the 60's Deram records "British accent Bowie" and "The Man Who Sold The World" period thanks to his odd key charges and the quirky delivery. The lyrics are interesting and one wonders what it might have sounded like in a finished, produced form, though it is totally out of character with the more light weight material that he was writing in '68 (some of which would resurface on his 2nd LP). Often cited as being Beach Boys influenced I'm going to go with the theory proffered many moons ago by my Twin Cities pal and music guru Keith Patterson that the influence for this demo instead comes from The Rocking Berries (check their hit "He's in Town" for reference). Recorded in 1965 one suspects the guitar is probably that of Lower Third band mate Denis Taylor. It first emerged in 1991 thanks to Shel Talmy on Rhino records essential CD "Early On 1964-1966" (now out of print it changes hands for a decent amount of $). Bowie's early 1967 demo "Silver Treetop School For Boys" was not only actually covered and released by another artist it was done so on two occasions! The first was by The Slender Plenty in September 1967 (Polydor 56189) and later by Scottish group The Beatstalkers (who were handled by David's manager Ken Pitt) in December (CBS 3105). With a wry bit of social observation that would do Ray Davies proud, Bowie used a pot smoking scandal that was alleged to have involved the prestigious Lancing College which, as the oft told story goes has it, he read about in a newspaper. I can find no mention of any such incident anywhere and am loathe to regurgitate an old rock n' roll tale but why let the truth get in the way of a good story right? Full of a catchy melody and some amazingly witty double entendres it would have made a great Deram era Bowie single. It was also recorded (but unreleased officially until 2013) by The Riot Squad during their brief period of working with him. Though various sources state that it's Bowie singing lead on their version I beg to differ as it sounds nothing like him. 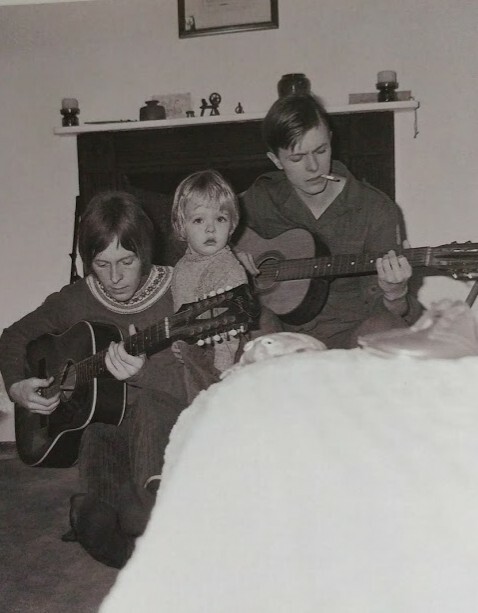 This demo, cut with guitarist and former Buzz member John "Hutch" Hutchinson, will become familiar immediately upon listening as an early version of "Letter To Hermione" from David's second LP. The lyrics were later adapted after Bowie was dumped by the song's subject, Hermione Farthingale (who along with Hutchinson and Bowie was a member a short lived trio called Feathers). 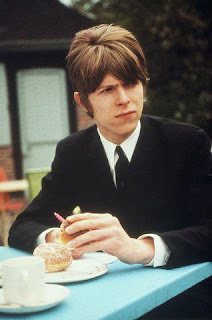 Pitched (unsuccessfully) to Manfred Mann's producer Ken Burgess in the hopes of them recording it, "Everything Is You" was eventually cut by Bowie's manager Ken Pitt's other act, The Beatstalkers as the flip to their next to last 45, 1968's "Rain Coloured Rose's" (UK CBS 3557). The lyrics seem to reflect someone working on a construction gang (or logging maybe?). It's infectious but difficult to imagine as something he would have released in the 60's. 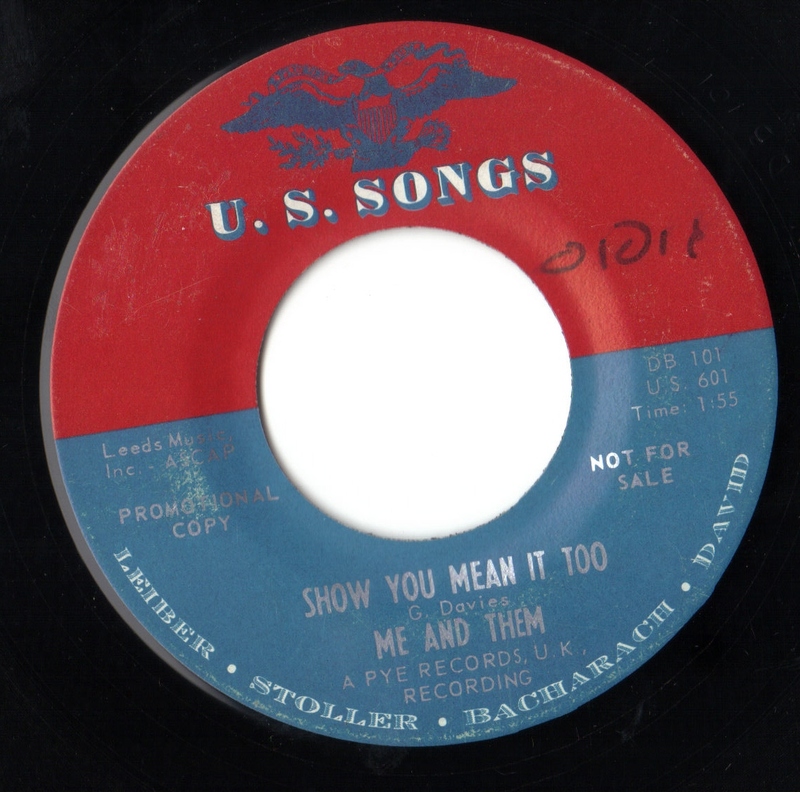 This 1967 demo (offered unsuccessfully to singer Chris Montez) remained undiscovered until 1993 when an acetate demo was auctioned off for an undisclosed price. 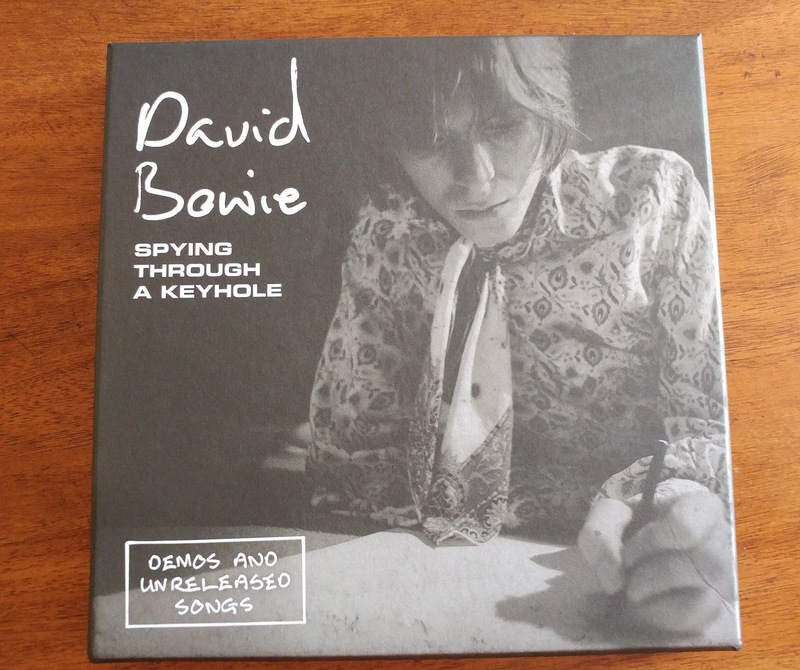 It's of surprisingly decent quality and though it's nothing remarkable (Bowie seems to be straining on the key it's in) or witty it's worth a listen. This oft bootlegged track was recorded not with the Buzz as is often incorrectly stated, but with the Lower Third. Cut at the famous RG Jones studio in Morden, Surrey in October 1965 and was issued as an acetate on the studio's Oak label making it one of the most expensive Bowie seven inches in existence. It falls somewhere between the teen angst of Bowie and The Lower Third's 1965 45 "You've Got A Habit of Leaving" and The Kinks at their most dirge like. "Social Girl" is one of those handful of mid 60's Bowie demos that was never recorded by anyone and as a result is one of his most obscure tracks that has not even graced any bootlegs to my knowledge. It benefits from some interesting double tracking on all the vocals (both lead and backing) that really reminds me of a light weight Pete Townshend pre-"Tommy" demo number (ie "Call Me Lightning" or "Magic Bus") especially with the percussive hand claps and high backing vocals. Completed with the full accompaniment of his then backing group The Lower Third, "Glad I've Got Nobody" was cut as a demo in 1965 (date and location uncertain). Writers are often quick to lazily cite The Who or Kinks as the influence on Bowie's '65-'66 material with The Lower Third, who backed him on just two singles ("You've Got A Habit Of Leaving" and "Can't Help Thinking About Me") . I think the apparent influence here is more of a mid tempo British beat influence which leads me to believe it was one of Bowie's earliest attempts at commercial conformity as it clearly resembles nothing he had released commercially, nor would. It's available on Rhino records essential CD "Early On 1964-1966". 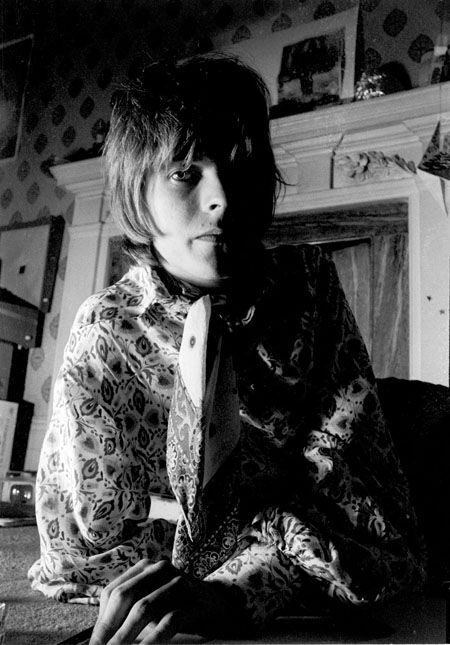 This homage to Bowie's early fascination with Tibet and Buddhism took shape in an entirely different lyrical form with the words concerning teenage trauma and leaving home (a theme also explored in his debut 45 as "David Bowie" with "Can't Help Thinking About Me") before being rejigged with lyrics about Tibet et al and eventually seeing light in its new form on his debut LP . This demo was cut again at RG Jones in October 1965 with the Lower Third, presumably at the same time as "That's A Promise" (see above) and comes off a bit disjointed and awkward but interesting in light of what it became.